So it’s been a long time in coming, a Conservative budget, almost 20 years. Well that’s a bit of a surprise given the number of ‘Conservative Lite’ budgets I can remember since 1996. All right then, so this is the real thing, a budget that accelerates inequality and injustice, through packaging significant changes in power relations under the rhetorical cloak of austerity. Under the last Coalition ‘Conservative Lite’ offering the social security budget was already the prime target for public expenditure cuts, but now what was considered unthinkable just a few months back, and said to be quite impossible to deliver, is presented as a reality. A further £12 billion is to be lopped off what is now termed welfare. The UK Welfare budget today stands at £220 billion annually. The pensions element accounts for just under half, at £95 billion. But as this is ‘ring fenced’ it is not to be touched. One small component, costing some £700 million, is the free TV licenses for the over 75s, which the BBC have now been bounced into picking up. So where else can Osborne’s axe fall? Well there’s Job Seekers Allowance, so beloved by the Daily Mirror and Channel 4, given their regular exposure of skivers, scroungers and swindlers. Job Seekers Allowance, however, amount’s to just £5 billion, a mere 2% of the entire budget. So Gideon’s axe needs to fall elsewhere. Housing Benefit, at £24 billion and ever rising, is ever a target. Removing 18 to 21 year old job seekers from Housing Benefit has previously been flagged. Both the Conservatives and their New Labour predecessors have long objected to young unemployed people receiving housing support. New Labour pioneered single room supplements, for young people in the private rented sector, before the Coalition Government rolled it out for all council housing. Do these politicians really believe that under-21 year olds should reside with their parents? The realities of life and the vulnerabilities of some, unfortunately challenge the politicians’ worldview which appears to draw inspiration from Radio Four’s The Archers. So this small cut will produce similar crude and cruel outcomes as the ‘Bedroom Tax’, but is also likely to cost more in the long run given the knock on consequences for homelessness. Tax Credits, which account for £30 billion of spend, by contrast offer a far easier pickings. Again this cut has already been well trailed. Steve Hilton, the Prime Minister’s old head of policy, conveniently popped ‘across the pond’ to offer up his wisdom: Why should government subsidise low pay? A good question we all say, especially since now those experiencing poverty are more likely to be in low paid employment. Introduced by Gordon Brown for those bringing up children in relative poverty, with incomes 60% of the median, there are two types of credits, child and working. They are also quite separate from child benefit, also being examined on grounds that, surely having two children is quite enough. Child credits are payable for each child you have responsibility for, as long as they are under 16, or under 20 and in approved education or training and you don’t need to be working to claim such a credit. Working tax credits can provide just under £2k a year on top of your income, if you meet the strict criteria. With one child in the household support is available for those up to £26, 100 gross, while with two children its up to £32,900. Across the UK 4.5 million households qualify, hence the £30 billion spend, which is 14% of all welfare spend. Big and small business will now be expected to pick up that slack, hence the chatter from Boris Johnston and other Tory’s grandees about their commitment to the ‘Living Wage’ and chiding Sainsbury’s, Tesco’s and others to pay decent wages. The compensatory 25% increase in the Minimum Wage required to meet the envisaged shortfall is unlikely to materalise, given it just rose by 20p recently, taking it to £6.70, and is set to be just £8 by 2020. By contrast the ‘Living Wage’ currently is £7.80 and £9.15 in London. Taken together Tax Credits dramatically cut child poverty, with the proportion of children living in poverty falling from 35% to 19%. Poverty is after all a political choice, to quote Nelson Mandela. So little surprise then that Iain Duncan Smith, the Welfare Supremo, moved to act after memorably visiting Glasgow’s poverty wasteland of Easterhouse, was quick to announce late last month that the basis of tackling child poverty would now have to change. As the Conservative Manifesto revealed, in order “to eliminate child poverty and introduce better measures to drive real change in children’s lives” there needs to be a recognition of “the root causes of poverty: entrenched worklessness, family breakdown, problem debt, and drug and alcohol dependency”. So in the future, will child poverty only be officially recognised if subjective measures such as drug and alcohol abuse or family breakdown are present, not just the objective measure of low household income? Is this but another example of The Archer’s worldview, namely that its drink, drugs and divorce that causes poverty, rather than a basic lack of money? Osborne, Cameron and Duncan Smith argue their political strategy is needed to move Britain from “a high-welfare, high tax, low-wage economy to a lower-welfare, lower tax, and higher wage one”. So while past Tory Chancellors ‘earned their spurs’ in cutting taxes – Howe reduced top rate taxes in 1979, Lawson cut corporation tax in 1984, while Major reducing the top rate from 60 to 40% and set the basic rate at 25% in 1988 – Osborne has opened up a new front, securing his campaign decorations, via utilising austerity to at long last dispatch the Welfare State. George Monbiot recently noted that such an agenda is pure Malthusian, predicated on an early nineteenth century moral philosophy construct that considers poor relief to be the cause of poverty, and that such assistance destroys the work ethic and reduces productivity. Malcolm Rifkind when Secretary of State for Scotland, espoused an identical mantra when launching his ‘New Life for Urban Scotland’ crusade to rid Scotland of deprived council estates back in 1988. Scotland has real form in this regard, given that Thomas Chalmers, the evangelical Presbyterian who split the Church of Scotland during the Great Disruption of 1842, also preached and practised the very same moral philosophy in both his Glasgow and Edinburgh parishes. The SNP by contrast articulates a quite different position, that of anti-austerity and social justice. For them money via social security offers people choices. But after this truly Conservative budget, choices for the poor will be greatly limited. With these savage cuts in welfare, plus a new benefit cap of just £20k, following on top of what is already in stream via deep disability cuts, the long awaited roll out of Universal Credit, plus the effective criminalisation of the poor via the brutal and vindictive DWP sanctions regime, the poor will find themselves in a even more precarious position with insecurity and fear being explicitly utilised by the Conservative government. For the wealthy, the resultant substantial Exchequer savings will fund further fiscal largess. Hence, the announced increase in the inheritance tax limit, now only payable for property over £1million, whilst further cuts in corporation and personal taxes are about to follow. Noam Chomsky, recently commenting on the Greek Crisis, said Austerity was just a fancy word for Class War. This Conservative budget offers up their battle plan for that conflict. The SNP given its rhetoric and the composition of their newly garnered political support will need to have a response. Consulting over the summer as to what the public considers constitutes Social Justice might, at first glance, appear to be somewhat limited and inadequate. I’m sure they’ll continue to use tax payers money to inflate house prices with help to buy. Helps Gideon’s mates get their next yacht. When are the SNP going to start organizing it membership, they are so proud of, to fight this. They are the biggest grass roots organization in Scotland, at the moment, who are doing NOTHING. They spout lots of rhetoric but will not call on their membership to act. They are our political leaders and as such have a responsibility to the lead. Where are the rallies? Where are the demonstrations? WHERE ARE THE SNP? Or are we only going to see them at election time and I thought they were the voice of the people of Scotland. In fairness to the SNP, the budget will be announced today. It’s a bit difficult to set up an opposition when you don’t know for definite what you’re opposing. I totally agree. The time for rhetoric will be over soon, and decisive action is required. The SNP needs to articulate its plan. A hell of a lot of people in Scotland work full time but still need some form of benefit to survive. These “hard-working” people so honoured by millionaire George Osborne are becoming more and more hard-pressed. An oil fund like Norway’s would have helped, but we all know how Westminster squandered that chance. They dont give a f*** about us, you need to get this into your head.They are in the process of dispensing with all benefits so they can bring in a complete pay as you go insurance policy run by them and their friends.At the moment all this is taking is a bribe for the middle classes who for the most part believe the scrounger sh** the media spouts.Remember most of the middle class live by the “im all right jack” code. THIS IS NOT ABOUT MONEY, THIS IS A CHANGE OF IDEOLOGY TAKING PLACE. The only thing i would argue with is “change” of ideology The ideology has always been there but now there is an opportunity to put this into full-speed-ahead action. And the only survival which concerns them is their own. The Tories are not fools they know exactly what they are doing. The Myth Commission Powers are a series of cunning traps designed to make the Scottish Government glorified tax collectors giving virtually no room to maneuver so implementing these powers are more than difficult. Unionists will bang on endlessly about when they are to be used solely for their own political advantage. Once again no offence but Syriza weren’t running Greece at the time nobody was or is yet. At the moment they’re playing poker, I hope they win BTW but they’re depending on help from others and when the chips are down let’s see if those others rhetoric is backed up by deeds. Syriza won the Greek general election in January 2015. They have been the incumbent government since then so I am not quite sure what time you are talking about as they have marched and protested on the streets on numerous occassions since then. The Troika were trying to run Greece and the referendum just reminded them that they are not. Also any ‘welfare’ cuts removes money from local economies and local businesses, usually small ones. To add to that, councils will really be struggling more than ever, because any cuts to so called welfare will impact on their income from rent and council tax, especially when universal credit kicks in and folks cannot manage their money monthly, as Housing Benefit will be lumped in together with ESA, Job seekers, and pretty much every other ‘benefit’. It’s a very complicated system as well. It’s extremely concerning to say the least. So, if as we do, have many on low wages and reliant on tax credits etc, the whole economy of Scotland suffers, the welfare pot not paying out as it needs to from Westmonster, lose lose for the people and government of Scotland. Absolutely despicable to be facing this in a rich country, in 2015. And Jim Scott has some very good points in his comment. It’s not quite the same as Greece, the English could put their tanks in our streets, because we are shackled to ukok. Indeed, and it would not be called war as it would be if we were not shackled to their dysfunctional nasty regime. It is also quite possible that they would at the same time dismantle our Parliament, rather then just emasculating it with their vetoes on anything that we try to do differently. Has it ever been more obvious that a country is colonised by it’s land neighbour, while being demonised and asset stripped big style. I don’t think I can bare to even speak to the no voting neighbours and friends since the budget, got better things to do. They are intelligent people, had their free degrees (some did more than one!) and, cheap mortgages, early retirement thank you very much, free bus pass, fuel grants etc et . They knew exactly what they were voting for, more money for them, cuts to essential services for those that really need them. Gits. “Osborne, Cameron and Duncan Smith argue their political strategy is needed to move Britain from “a high-welfare, high tax, low-wage economy to a lower-welfare, lower tax, and higher wage one”. OK, at least that’s a policy, and we can debate its rights and wrongs. But what is totally surreal about this claim is that in reality Osborne’s budget doesn’t do this. Instead of lowering taxes, he’s raised them. You don’t have to take my word for it – in the words of Robert Chote, the Chairman of the Office for Budget Responsibility, “the tax increases are roughly twice the size of the tax cuts in aggregate”. 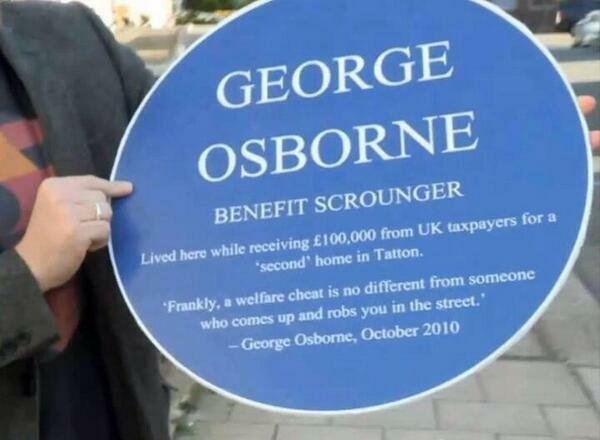 How does Osborne get away with it? We’ve got a dysfunctional political system, that’s how. 25% of the electorate voted this lot in, so the other 75% who voted against, or didn’t vote at all, have to put up with this sham of a democracy. We have Hailsham’s “elective dictatorship” and there’s no way out of it for at least another 5 years, and possibly ten, unless we declare Independence and fight for a fairer more caring Scotland.